The Trump administration is forging ahead on the proposal to raise the height of Shasta Dam despite California’s opposition to the plan and the fact that state law prohibits the enlargement, which would harm the state-protected wild and scenic McCloud River. In March 2018, House Majority Leader Kevin McCarthy inserted a $20 million cash infusion for design and other preliminary work on the dam raise into a must-pass spending bill. The Department of the Interior plans to award a construction contract by late 2019. Westlands Water District, the primary beneficiary of any increased water flows from a larger reservoir, is the agency preparing the Environmental Impact Report for the Shasta Dam Raise Project. Donate to the Winnemem to stop the dam raise and save the salmon. Immediate action is necessary. Please write to California Senators Dianne Feinstein and Kamala Harris and let your California state representatives know that you support defending the wild and scenic McCloud River and protection of Winnemem Wintu sacred sites. As a northern California tribe seeks to bring Chinook salmon back to their native waters, the U.S. government pursues a massive dam construction project that could further endanger fish, habitat and native culture. Shasta Dam, built between 1938 and 1945, created California’s largest reservoir when it blocked the flow of the Sacramento, McCloud and Pit Rivers. 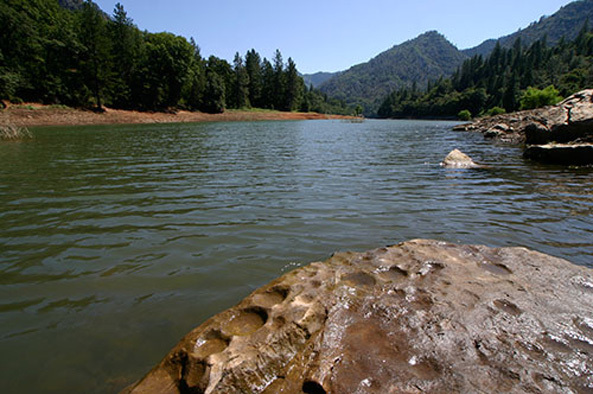 Native people of each river canyon were displaced, and promises to provide replacement lands were broken.1 Ancestral homelands of the Winnemem Wintu people lie under the waters of Shasta Lake where the Winnemem, or McCloud River, once flowed. Today, the Winnemem people own no land on the McCloud River. Their tribal lands were taken at gunpoint by miners and settlers, taken by government fiat and handed to railroad barons, taken by wealthy sportsmen who bought from the railroads, and taken using eminent domain for the purpose of building the dam and reservoir.2 To conduct ceremony on their remaining ancestral sites, the Winnemem must ask permission of the U.S. Forest Service or private landowners. Before the era of the dam, Chinook salmon born in the cold waters of the McCloud River migrated to the ocean, and returned years later to spawn and die in their home waters. The ceremonial cycles of the Winnemem were tied to seasonal runs of salmon, the great food fish of many California tribes. When Shasta Dam was built, no plan was made to allow for passage of the fish back to the cold waters of the upper rivers, and the salmon began to die off. Fish hatcheries below the dam have enabled some salmon runs to survive, but the winter-run Chinook salmon are facing extinction. The mature adults run upstream from the sea in the winter months, then spawn in spring and summer. During the hot months, the water temperature below the dam is too warm for salmon eggs and small fish, or “fry,” to survive. Decades ago, before dams were built blocking their traditional spawning habitat, vast schools of Chinook migrated from the ocean to spawn and die in California’s rivers in various runs timed with the seasons. The largest run that remains in the Sacramento River system is the fall run, which survives almost entirely due to hatchery breeding programs below Shasta, Oroville and Folsom dams. The winter run, in contrast, is still largely reared in the wild. Adults lay their eggs in gravel beds along a few miles of river below Shasta Dam. Their numbers have dwindled in the face of predators and deteriorating river conditions. The federal government declared the run endangered in 1994, and it has flirted with extinction ever since. —Ryan Sabalow, Sacramento Bee, Sept. 24, 2015, Read more here. In 2015 the U.S. Bureau of Reclamation, which manages Shasta Dam and Shasta Lake, released the Final Feasibility Report and Final Environmental Impact Statement recommending the enlargement of Shasta Dam by 18.5 feet. The proposed project, which requires Congressional approval, would enable the Bureau of Reclamation to store and provide more water during very wet years, primarily for the benefit of Southern California agriculture. The necessity for dam enlargement has been questioned based on the small number of years when the current reservoir reaches capacity and the fact that California water use has been declining, thanks to increased efficiency and conservation.4 The proposed project also claims to benefit endangered salmon. Reviewing the draft reports as required under the Endangered Species Act, U.S. Fish and Wildlife Service biologists concluded that the proposed project would harm salmon. For the project to proceed, a permit from the USFWS is required. One of the fears expressed by foes of the proposed dam raise is that the USFWS will issue a permit in defiance of the findings of its own scientists. Costs of the project, estimated at $1.4 billion,5 would be borne by American taxpayers—possibly supplemented by contributions from cities and large agricultural landholders in the Central Valley who already receive subsidized water flowing south from Shasta Dam. The State of California will likely not contribute to the cost of the project, as the McCloud River is protected under the California Wild and Scenic Rivers Act, and the enlargement of Shasta Dam would inundate the lower McCloud and its unique wild trout fishery6 thus breaking a California environmental protection law. The political push for the dam raise has come primarily from California’s senior U.S. Senator, Dianne Feinstein, Congressional representatives from rural and agricultural districts, and the Westlands Water District, a quasi-governmental organization representing large Central Valley farm landholders. In 2007, Westlands purchased, for $35 million, the Bollibokka Club: 3,000 acres of scenic land along the lower McCloud River, which had been owned by one San Francisco family for over 100 years. If the dam is raised, that stretch of river will be flooded, along with most of the last remaining Winnemem sacred sites, village sites and graves. In seeking a larger share of northern California’s water resources, farms of the southern Central Valley have employed clever propaganda campaigns. Along Interstate 5 between the San Francisco Bay Area and Los Angeles, signs claim that Congress has withheld water deliveries, causing the death of crops. Orchards planted along the freeway have died, their charred and twisted remains left as an appeal to passing travelers to blame the government rather than question the wisdom of planting water-hungry fruit trees in a desert. In fact, many farmers in the Central Valley have successfully made do with less water than desired by transitioning from wasteful irrigation practices to efficient ones. Even as farmers clamor for more water, thousands of acres have been forced out of production as a result of destructive irrigation in a desert environment, which has led to sinking soils and rising levels of salts and toxic minerals that threaten bird and animal life.8 In California, water is gold; if farmers can’t use all of their allotments of taxpayer-subsidized water, they can resell the extra on the open market. Developers thus gain access to water for new communities built on inhospitably dry terrain, cities can purchase excess farm water, and energy companies can bid for the resource for oil and gas pumping, which requires huge amounts, later injected into wastewater wells. In 2014, and again in 2015, Senator Feinstein attempted—through closed-door negotiations with Republican colleagues—to attach a drought bill to a must-pass, end-of-year spending bill, which would have moved the Shasta Dam raise project forward. Each attempt failed. The high cost of the proposed Shasta Dam construction is coupled with a potentially high political price. During an era when dams are coming down and above-ground water storage in large reservoirs is increasingly criticized as outmoded and inefficient, representatives in Congress may balk when it comes time to vote to appropriate tax dollars in the face of public outcry. “When they built the dam they blocked us and the salmon from our homelands,” said Caleen Sisk, Chief of the Winnemem. Her small tribe has consistently opposed the dam raise, and encouraged effective measures to protect the endangered salmon. Sisk has proposed a fish swimway to enable the McCloud River salmon to find their way back to the upper river, a proposal that has piqued interest among biologists, environmentalists and other advocates for the fish. Because the 2009 Biological Opinion concluded that the Bureau of Reclamation’s proposed dam raise would jeopardize the endangered Sacramento River winter-run Chinook salmon, the Bureau was required to pursue some kind of fish passage around Shasta Dam. Removal of the iconic salmon species from the McCloud, Sacramento and Pit Rivers affected the interconnected flora and fauna of the entire ecosystem. Species that depended on salmon for food ranged from bugs to birds to bears; other fish, plants and trees shared in the benefits salmon brought to water quality, and even as soil fertilizer. The effect of the loss on Native American subsistence and culture was devastating. Despite their history of being forced off McCloud River lands, the Winnemem continue to advocate for the salmon and for righting the historical wrongs that denied people access to their sites for hunting, fishing, gathering and ceremony. If the proposal for a fish swimway goes forward, the Winnemem know where to find wild McCloud River Chinook with which to repopulate the river. In 1872, the pioneering U.S. government agent Livingston Stone opened a hatchery at Winnemem fishing grounds on the lower McCloud River. A year later he carefully packed live salmon eggs in moss-filled cannisters and sent them to fisheries from Iowa to Maine—and as far away as New Zealand.11 It’s there, in the Rakia River, that wild McCloud River salmon still thrive. In 2010, members of the tribe traveled to New Zealand to see the fish, to dance at the river’s edge, and to sing prayers for their relations, the salmon.12 With the cooperation of Maori people, scientists and rangers from New Zealand, the Winnemem have raised funds to test the fish to try to convince U.S. agencies that the Rakia River salmon have not lost those qualities that made them indigenous to northern California, and to prove that they need not be considered a non-native species. In 2018, members of the tribe returned to New Zealand to collect tissue samples for DNA testing by UC Davis fish biologists. Beginning in 2016, the Winnemem have held an annual Run4Salmon each September, a three-week journey from San Francisco Bay to the McCloud River on foot, bicycle, horseback and boats, following the path of the salmon back home. Along the way, participants pass many obstacles that the fish have to overcome, swimming against the stream all the way. Bring back the magical fish: salmon, California’s remarkable anadromous species. Join opponents of the dam raise. Donate to the Winnemem to save the salmon. 6 Final EIS, USBoR, Dec. 2014, Chapter 25: Wild and Scenic River Considerations for McCloud River. 8 “California drought: Central Valley farmland on its last legs.” SFGate.com, 3/24/14.